A word of warning – this is NOT a low-cal dish…but every now and again we need to indulge! I debated whether to create a lower-calorie option…I could have used low-fat spread instead of butter, skimmed milk instead of semi-skimmed, etc, but there are some recipes that I feel just need to be allowed to stay indulgent. Keep the heat low – do not boil! These will only take a couple of minutes to cook; turn once halfway through cooking. It’s ok if the scallops caramelise a little…this adds to their unique sweetness. Don’t over-cook them or they’ll become really rubbery! Even if they’re still a bit raw, it doesn’t matter as they’ll finish cooking in the oven. Add them to the other fish in the oven dish. Add the mussels and the petits pois to the oven dish. 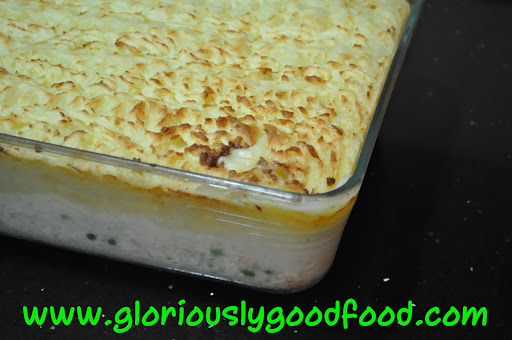 In a saucepan, make the Béchamel sauce by starting off with 30g butter and 4tbsp plain white flour, then gradually adding the milk used to poach the fish pie mix (don’t worry if there are bits of shallot in there; they won’t harm the making of the sauce). For detailed instructions on making Béchamel sauce, click here (use the milk you’ve poached the fish in instead of cold milk…and don’t use any nutmeg!). Pour the Béchamel Sauce onto the fish, scallops, prawns, mussels & petits pois in the oven dish and stir lightly/gently…just enough to ensure the sauce & other ingredients are evenly distributed. Be careful not to break up the fish too much. Using a spatula, carefully cover the fish & sauce mixture with the mashed potatoes, starting off by placing mash around the edges of the dish, then working inwards. Make sure the mash is distributed evenly and smoothly, then use a fork to decorate it & loosen the surface (run the spikes of the fork down the surface gently, either in straight lines or waves or zigzags), as this will allow for crisping up in the oven. Leave to stand for about 5 mins before serving, as this will make it easier to serve without it going too ‘sloppy’. Serve with freshly steamed broccoli or other vegetables of choice. 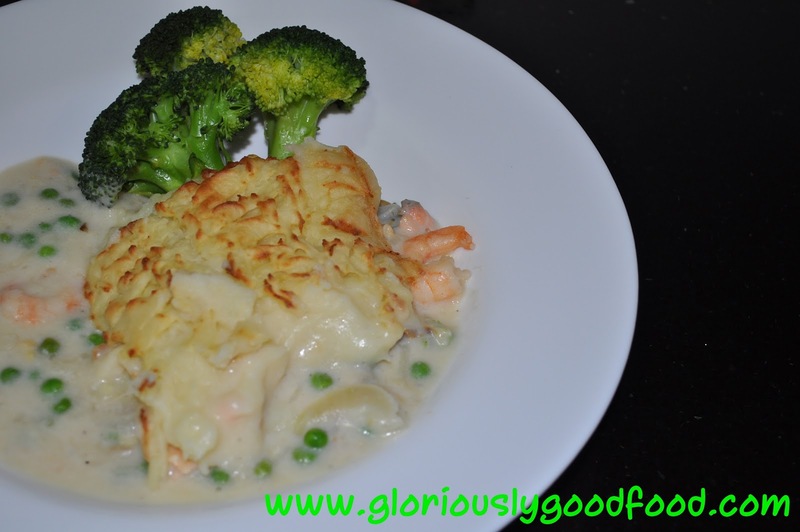 This entry was posted in Fish / Seafood, Wholesome, Winter Warmers and tagged béchamel sauce, fish, fish pie, mash, mashed potatoes, mussels, petits pois, prawns, scallops, white sauce. Bookmark the permalink.